The Wysong company is a holistic brand of high-quality pet food. Wysong describes themselves as a small company with a big goal – to help pets and their owners live long, happy, and healthy lives. This company is unique in that they design their products in keeping with the idea of archetypal feeding which is not based on a specific ingredient but on a rotational style of feeding to provide the greatest chance for full-spectrum nutrition. The Wysong Corporation has two goals, one of which is to produce natural and holistic pet food products. The other is to provide pet owners with the information they need to make sound nutritional decisions for their pets. That is why their website is loaded with useful information about the ingredients they use in their products as well as answers to general pet health questions. If you are looking for a pet food company that legitimately cares about your pet, then Wysong is it. The Wysong brand of pet food is made by Wysong, a famiy-owned company based in Midland, Michigan. The Wysong company was established in 1979 by Dr. Wysong and it is one of the true pioneers of the natural pet food industry. Though Wysong offers a variety of dog food products, they also make food for cats, ferrets, horses, and other animals. Wysong is also known for their nutritional supplements. Is Wysong Made in the United States? The Wysong Corporation is a family company that has been producing high-quality holistic pet food products for nearly forty years. Wysong develops and manufactures all of their own products using sound science and nature as their guiding principles. This company doesn’t outsource the production of any of their products and, if you check the packaging, you will see that each bag of Wysong carries the label, “Made in the USA”. While Wysong does state that their products are made in the United States, they do not provide specific information about exactly where their manufacturing facilities are located. Where Does Wysong Get Their Ingredients? Wysong is based in the United States, having their headquarters in Midland, Michigan. As a U.S.-based company, it is safe to assume that Wysong sources most, if not all, of their ingredients from the United States as well. Unfortunately, there is nothing on the Wysong website to either confirm or deny this assumption. In September 2009, the Wysong company issued a voluntary recall for several lots of Wysong dry food due to potential for mold contamination. The products affected by this recall were Wysong Maintenance recipe, Wysong Senior recipe, and Wysong Synorgon. Wysong dog food products can be found primarily in local pet food chains and specialty pet food stores – you can also purchase them from online pet food retailers or on the Wysong website. Wysong typically doesn’t offer coupons on their website but they do sometimes offer sales and free shipping promotions. You may be able to find Wysong dog food coupons from individual retailers. The Wysong brand is a premium brand of pet food that uses high-quality ingredients including novel proteins like rabbit and duck. 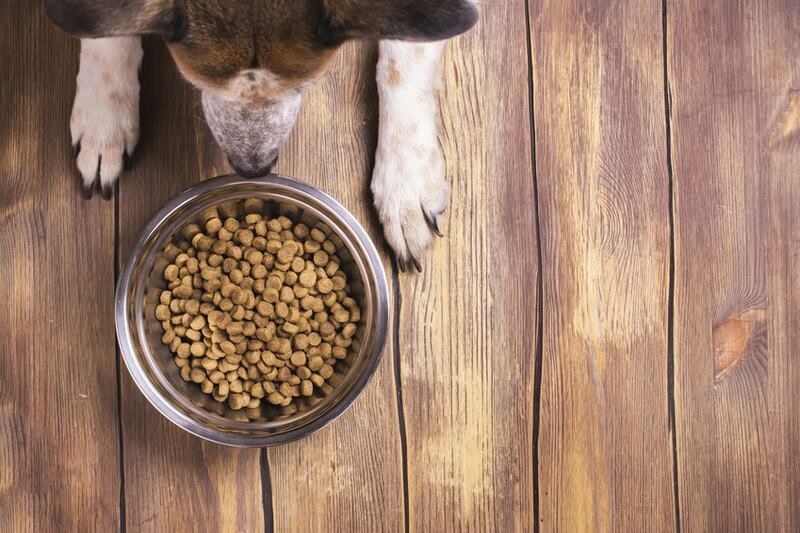 Because this brand offers exceptional quality, you should expect to pay a little more for their products than you would for the average kibble. Wysong dry dog food comes in 5-pound bags that sell for $8 to $35, depending on the recipe. Wysong wet dog food comes in 13-ounce cans and is sold online in cases of 12. A case of Wysong wet dog food costs between $19 and $60, giving you an average price of $3.30 per can. What Kind of Recipes Does Wysong Offer? When it comes to their dog food products, Wysong offers three different types. Wysong dry dog food is designed to mimic the archetypal diet of wild dogs which is formulated according to carnivorous genetic requirements. Each dry food recipe is intended to be used as part of a rotational diet to provide your dog with the dietary variation he needs for complete nutrition while also reducing the risk for food allergies and sensitivities. Wysong canned foods are made with extremely high meat inclusions and they can be fed as a standalone meal or as an adjunct to one of Wysong’s dry products. In addition to dry and canned foods, Wysong also has an assortment of raw products. These products are described as True Non-Thermal raw foods that are processed below 118°F to preserve the nutritional quality of the raw ingredients. All of Wysong’s products are made with premium animal proteins like lamb, rabbit, chicken, and duck as well as other healthy inclusions like fresh fruits and vegetables. Wysong also supplements their products with their industry-leading micronutrient spectrum to ensure nutritional completeness and balance. The Wysong brand of dog food has been producing premium pet food products for nearly forty years. This brand focuses each of their recipes around high-quality animal proteins like chicken, rabbit, salmon, lamb, and duck. Wysong adheres to a holistic philosophy for pet nutrition and they also believe in a rotational style of feeding. This means that you can alternate between two or three Wysong recipes every few weeks to help balance out your dog’s nutrition while also reducing the risk for food allergies. Overall, Wysong products offer high quality and excellent nutritional value. This Wysong Synorgon Recipe Dry Food is a high-quality dry food recipe that has been fed to tens of thousands of dogs for more than thirty years. Although this recipe is three decades old, it has been perfected over time and will do more than just meet your dog’s minimum nutritional requirements – it will exceed them by far. This recipe has been prepared using advanced processing methods to preserve nutritional value and it is higher in meats, organs, and fats than most dry food recipes on the market. In addition to being rich in protein and fat, this Synorgon formula contains high levels of micronutrients and nutraceuticals including prebiotics, probiotics, digestive enzymes, omega-3 fatty acids, and antioxidants. Simply put, it is an excellent recipe that any dog would be lucky to receive. The first ingredient in this recipe is chicken, a high-quality animal protein. One thing you should be aware of with fresh meats like chicken is that they can contain up to 80% moisture by volume. When the final product is cooked to a moisture level of 10%, most of that moisture cooks out and the final volume of protein could be much lower. This is why supplementary proteins are so important. This Wysong Synorgon Recipe Dry Food includes several supplementary proteins including fish meal, eggs, and crab meal. Fish meal is simply fresh fish that has been cooked to remove moisture, making it a highly-concentrated source of animal protein. The only problem is that the fish does not come from a named source (like salmon meal), so it is difficult to judge the quality of this ingredient. The main source of carbohydrate in this recipe is brown rice – a whole grain that is considered highly digestible for most dogs. This ingredient is supplemented by fresh peas which are also highly digestible. One thing to be aware of with peas, however, is that they contain a significant amount of plant protein. There are also some other ingredients that contain plant protein like flaxseeds and dried kelp. It doesn’t appear, however, that these ingredients contribute significantly to the total protein content of the recipe. There are also some supplementary sources of fiber such as flaxseed, dried plain beet pulp, and tomato pomace. The fresh fruits and vegetables used in this recipe provide some dietary fiber and carbohydrate energy as well, though they are more valuable as natural sources for key nutrients. The remaining ingredients in this Wysong Synorgon Recipe Dry Food consist primarily of fats, flavors, extracts, and supplements. The main source of fat in this recipe is chicken fat which, though it may not sound appetizing to you, is actually a highly nutritious ingredient for dogs – it is also an excellent source of natural chicken flavor. This ingredient is supplemented by coconut oil and fish oil to ensure a balance of omega-3 and omega-6 fatty acids. In terms of supplements, this recipe includes both prebiotics and probiotics (the dried fermentation products) as well as synthetic vitamins and minerals. It is good to see that some of the minerals are chelated – this helps to increase their absorption and uptake. This Wysong Synorgon Recipe Dry Food is formulated to meet the nutritional levels established by the AAFCO Nutrient Profiles for maintenance. Overall, this Wysong Synorgon Recipe Dry Food is a great source of quality nutrition for dogs. This formula is rich in animal proteins and fats which will help to meet your dog’s energy needs while also promoting lean muscle mass. With brown rice as the primary carbohydrate, this recipe is highly digestible for most dogs, though it could cause problems for dogs with grain allergies or sensitivities. Although most of the ingredients in this formula are great, there are a few that some might consider questionable. For example, dried plain beet pulp and tomato pomace are both rich in fiber but limited in other nutrients. This recipe also includes montmorillonite clay which is not a common ingredient in dog food but does contain some valuable trace minerals. All in all, this recipe could be improved a little bit but it is still a great choice. This Wysong Adult with Organic Chicken Recipe Canned Food is described as a premium canned food that has been fed to thousands of dogs through multiple generations. This formula features 95% organic chicken with a limited number of other whole ingredients plus healthy supplements. What makes this formula different from the average canned food is that it isn’t loaded down with food fractions or artificial additives – it is packed with protein and other healthy ingredients, including beneficial micronutrients. As is true for all Wysong products, this canned food can be used as part of a rotational diet for dogs. The first ingredient in this recipe is organic chicken, a high-quality source of animal protein. In fact, chicken is the only source of protein in this formula. Fresh meats like chicken contain up to 80% moisture by volume which can sometimes be an issue for dry foods because, when the product is cooked and most of that moisture is lost, the final volume of protein may be much lower. This canned food has a moisture content of 75%, however, so that won’t be a problem. It is a little strange to see a moisture content as low as 75% for a canned food, and also strange that this recipe doesn’t include any water or broth. Most canned foods have between 78% and 85% moisture. The main source of carbohydrate in this Wysong Adult with Organic Chicken Recipe Canned Food is sweet potato. Sweet potato is a gluten-free and grain-free carbohydrate which makes it highly digestible for most dogs. This ingredient is supplemented by blueberries and organic barley grass powder, plus dried kelp and yeast extract. The chicory root that appears later in the list is likely included as a supplementary source of dietary fiber. The total fiber content of this recipe is 2% which is a little high for a dog food, but it doesn’t seem to come from any harmful ingredients. The remaining ingredients in this recipe consist of flavors and supplements, including several chelated minerals which offer excellent absorption and uptake for dogs. This Wysong Adult with Organic Chicken Recipe Canned Food is formulated to meet the nutritional levels established by the AAFCO Nutrient Profiles for maintenance. Overall, this Wysong Adult with Organic Chicken Recipe Canned Food seems to offer good nutritional quality, though there are some question marks. Organic chicken is a great place to start, though it is a little odd to see that broth or water is not the second ingredient – the moisture content of this formula is also a little low. This recipe seems to be lacking in fats and it is also a little high in crude fiber. It is good see that chelated minerals are used, but it wouldn’t hurt to add a few more fruits and vegetables as natural sources for key nutrients. All in all, however, this is a decent recipe for adult dogs.